The reviewer has been compensated in the form of a Best Buy Gift Card and/or received the product/service as at reduced price or for free. One of my good friends has a Nest Learning Thermostat. Whenever I go into her house, I am drawn to it. Simply put, it looks stunning on the wall. It’s elegant, cool and futuristic. 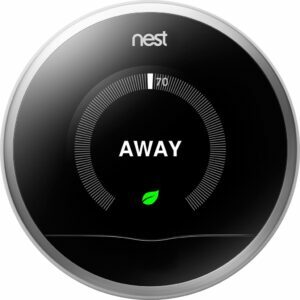 When I was given the opportunity to review the Nest Learning Thermostat and the Netgear® Nighthawk™ DST Router and DST Adapter with Geek Squad included, I jumped at it. We live in a tri-level home built in the 1970’s and we always fiddling with the thermostat and we have some “dead zones” where the WiFi does not work. My husband and I know that we could be doing a much better job with energy efficiency and now I am so excited to have a connected home. In independent studies, the Nest has saved users an average of 10-12% on heating and 15% on cooling bills so the goal is to have the thermostat pay for itself. Some local utility companies offer rebates – find out about available rebates online. This Nest is the new 3rd generation version, which is thinner, and sleeker in design, and allows for a bigger, crisper display than the prior 2nd generation version. I love the screen of the Nest. It is so easy to read and you can tell at a glance if it is heating or cooling your home. 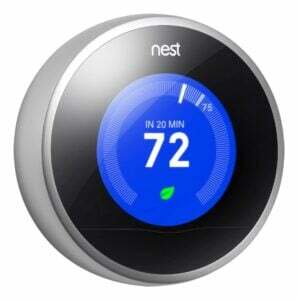 The body of the thermostat is a brushed stainless steel and the face is a rounded glass that looks like a lens. The design is beautiful especially compared to the ugly thermostat it replaced! We have had an exceptionally hot summer here in Southern California that is still lingering into October. We have run our air conditioning almost non-stop for months. Now the forecasters are predicting a rainy winter. We are pretty wimpy here in SoCal. Our heaters go on when the temperature dips into the 60’s. The Nest Learning Thermostat connects to a weather site and adjusts based upon current forecasts too. I have to say that the ultimate indulgence is laying in your comfortable bed and if the house is too hot or too cold, you can adjust the temperature from your smartphone sitting on your nightstand. How cool is that? Because I work at home all day, comfort is key to my productivity. Nest can sense when someone is home. It learns when the house is empty and your habits and it begins to regulate your home’s temperature based upon your schedule. When you are away, it automatically switches to an energy-efficient temperature and you don’t have to even think about it. 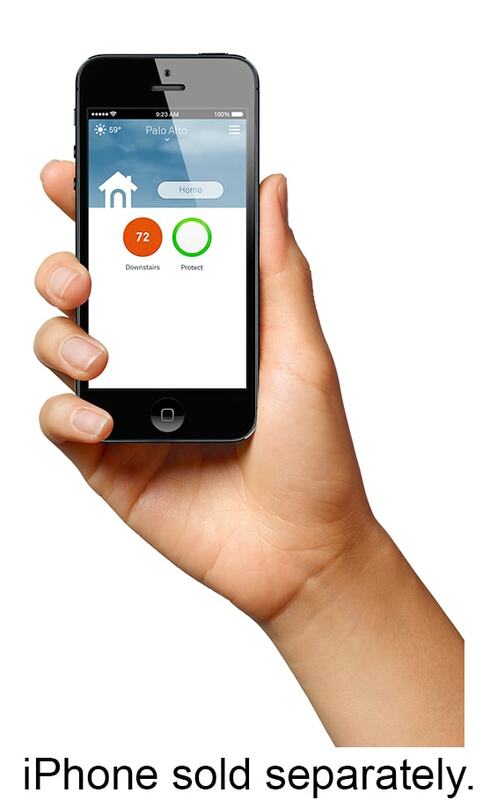 With a Nest learning thermostat you never have to come home to a too hot or too cold house. I was worried that the installation would be difficult, but hubby said I underestimated his skills (sorry!) If you have questions, you can call Nest customer service and they will be happy to help you. My supervisor always thinks the packages that arrive are for him! No more deadzones and a router that can handle all of our gadgets! Netgear® Nighthawk™ DST Router and DST Adapter with Geek Squad included is a brand new router that was exclusively developed between Netgear, an industry leader in the networking world, and Best Buy, to help provide consumers with an easy, all-in-one solution to support their home’s connected devices. As the number of Wi-Fi dependent products increase in a home – the average US household has 7 “connected devices” includingsmart phones,tablets, laptops, computers, Wi-Fi printers, gaming devices, streaming TV and movies. All of these devices put a strain on the home’s network, especially the router. 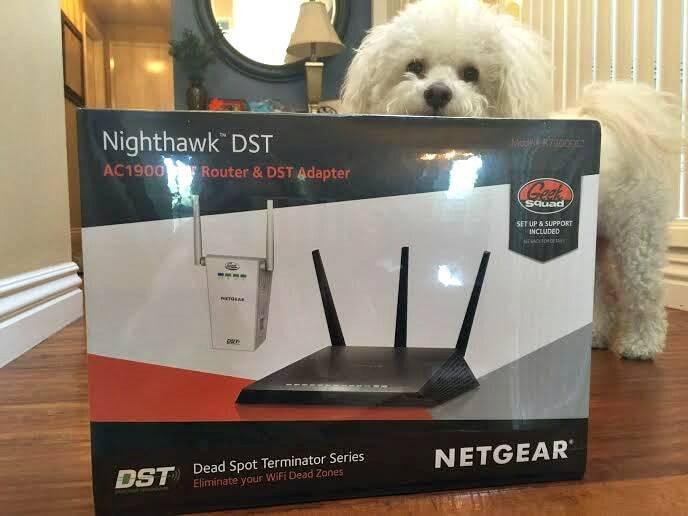 This high-performance router was built to support 10+ connected devices.Many households, mine included, experience slow Wi-Fi, dropped calls, “dead zones” – which could be improved upon with an “AC” router, Wi-Fi extenders and expert help. The Geek Squad service via phone & web allows customers to call or get help 24/7 whenever they want, vs. the need to schedule an appointment.Prior to installing the new router, we had a “dead zone” on our back patio which is actually one of the nicest spots in the house for me to bring my laptop and work outside when the weather is nice. Now I can work faster thanks to the lightning speed of my new router. We are looking forward to tracking our energy savings and working more efficiently with our Nest Learning Thermometer and our Netgear® Nighthawk™ DST Router and DST Adapter. My friend has one of these too. i do think they look nice on the wall. It’s great to be able to control it with your phone. I love this idea, it seems ideal for folks with a busy lifestyle. I’d certainly consider getting it if our electric system wasn’t ancient. I think that router is just what we need. We are living in my in-law’s basement and the internet connection down here is so terrible. My thermostat is giving me issues! This seems like such a wonderful one, I will have to look into getting this hands free model. Our thermostat has been acting up recently. I would love to check out this hands free model I am sure it would be great for us.